This week, we’re really pleased that we now have catering tubs available! These are perfect for any hotels, cafes, restaurants, caterers or cake makers who serve breakfast, afternoon tea or make cakes. 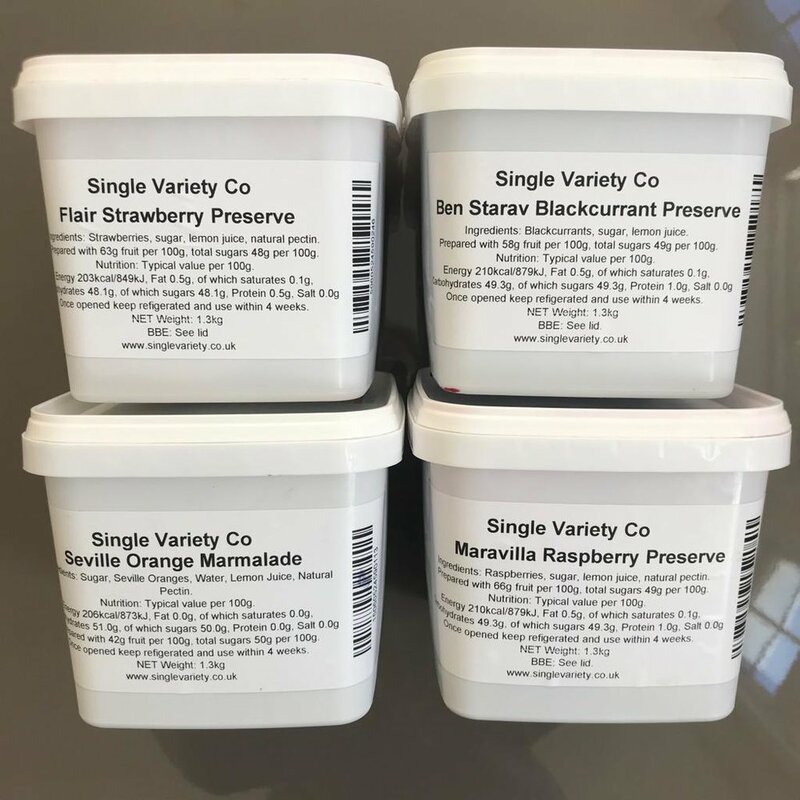 We have been busy getting the right catering solution for our customers and to start with we are launching our catering tubs in four flavours - Ben Starav Blackcurrant, Maravilla Raspberry, Flair Strawberry and Seville Orange Marmalade. So if you’re looking for some amazing tasting preserves to add to your menu, then please do get in touch with nicola@singlevariety.co.uk to find out more. With one of my favourite eating occasions of the year, Pancake Day, just around the corner, this is the perfect time to use up your favourite jam. Here are some ideas of what we’re going to be eating our pancakes with this year. We are loving our seasonal Harbinger Rhubarb Preserve and it is delicious with thick yoghurt, rolled up in a pancake. Sticking with our Harbinger Rhubarb Preserve, why not fold a pancake, top with a great quality vanilla ice cream and dollop a generous helping of Harbinger Rhubarb Preserve (or your favourite preserve) on top. Ben Starav Blackcurrant Preserve is one of my favourites, and filling a pancake with a good helping of this tangy preserve is such a simple but delicious treat. For more jam ideas, follow us on Instagram and Facebook. With a traditional bitter flavour, slices of thin cut orange peel and a fresh orange tang, our Seville Orange Marmalade tastes delicious however you choose to eat it. Like jam, marmalade taste great on more than just toast. Here are just a few ideas to get you started. The vanilla ice cream gives a great balance of sweetness to the tangy, bitterness of the Seville Orange Marmalade. Smother your ham joint part way through cooking for a sticky, tangy, citrus flavour to compliment the meat. Marmalade works so well in baking, from in muffins and cupcakes to making a sticky marmalade cake. Warm a croissant in the oven and serve with a dollop of Seville Orange Marmalade on the side. This heartwarming little pudding gives you another way to enjoy Seville Orange Marmalade. If you fancy making one yourself, here is a recipe to try. Preheat the oven to 180°C. Grease a small oven proof dish (around 10cm in diameter). Butter the bread and spread with the marmalade, then cut into chunks. Arrange half the bread in a single layer in the dish. Sprinkle with the mixed peel and half the sultanas. Add the rest of the bread in a layer, then top with the remaining sultanas. In a jug combine the milk, cream, sugar and egg. Carefully pour into the dish. Bake the pudding for 35 minutes. It will puff up while cooking so put a baking tray on the oven shelf below, just in case it leaks. Remove from the oven and grate the dark chocolate over. Allow to cool slightly, then serve. Our Seville Orange Marmalade is back in stock now. Click here to order this tangy treat. Planning on impressing someone this week with a home cooked meal? We have the perfect 3 course menu for you, obviously all featuring our Single Variety Co chilli jams and preserves. So get hot under the collar, and in the kitchen, with these simple but delicious meal ideas. Add a zing to this classic starter. Serve wedges of pate, with lightly toasted thick slices of granary bread and a dollop of Jalapeño Jam on the side. I don’t know about you, but having a fresh tuna steak for dinner is always a special treat in our house. Grill a tuna steak, then serve with a side salad and generous helping of Lemon Drop Chilli Jam. The citrus flavour in the lemon drop chilli jam works really well with fish, and the meatiness of tuna steak can handle the heat of our super hot chilli jam. To finish on something sweet, try this super quick and easy, but impressive dessert. Fill a sweet pastry case with Maravilla Raspberry Preserve, top with some fresh fruit and drizzle over some melted white chocolate. For more recipe ideas, head to our website and follow us on Instagram and Facebook. Happy Valentine’s Day!